I am a biochar practitioner in the United States; it is my career and has been since 2008. 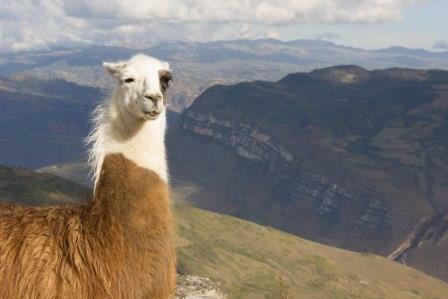 Recently I went to Peru. I went for personal reasons. 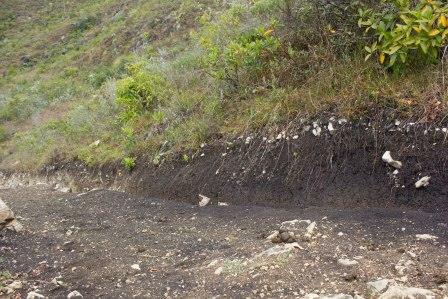 I didn’t go in search of biochar or Terra Preta-like soils, and yet much to my excitement, I found the use of charcoal in soils prevalent during my trip. On a mountaintop in Peru, surrounded by steep valleys cut by rivers that later become the Amazon River, are the ruins of the village of Kuelap. And this is where I found black Terra Preta soils—almost by accident. 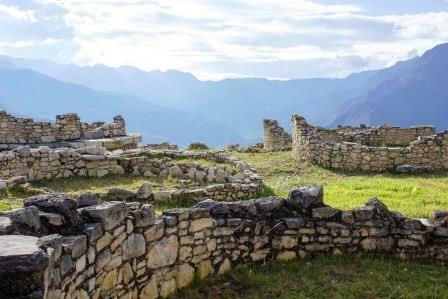 Kuelap was the citadel of the Chachapoyas, a fierce tribe who claim with great pride to be the only group not conquered by the Incas. They ruled the upper reaches of the Amazon, though you would never know it was the Amazon without travelling downstream as this area is desert in the valley areas and cloud forest in the tall peaks. Today, there is a village just below the mountaintop ruins, also called Kuelap. I had been in the region for a few days, starting in Leimebamba, a town that serves as a hub for the region’s many small villages and one of the few accessible by road (many of the others are only accessible by foot). While eating breakfast in Leimebamba, browsing my travel book for travel ideas, I noticed a courtyard garden and was invited in. The garden soil was black with fresh charcoal and instantly my plans for the day changed. I began to tour the gardens of willing village residents. 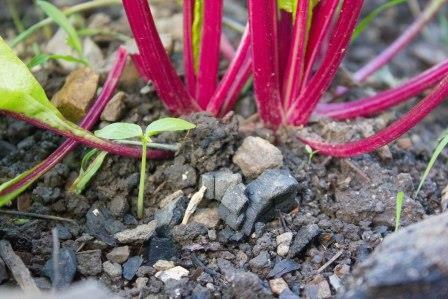 Every garden I saw had charcoal in the soil; some with large amounts. When I inquired, the responses seemed to be somewhat curious, as if, “where else would it go?” It reminded me of the American understanding of why a sneeze rarely ever goes without a “bless you”, it’s just what we do—it is our culture. Upon leaving Leimebamba, biochar was hot on my mind. Through the windows of the bus on the road to Kuelap, I searched the hillsides for more dark soils which I kept seeing on the optimal areas for agriculture (those that were less steep or rugged). The footpath to get to Kuelap is a rugged trail five miles straight up a mountain. When I arrived at the modern day village near the mountain peak, I was hungry and happily was met with the smell of freshly baked bread. It was a family residence and they were baking for their community. They invited me in and the bread, made from grains grown in their small community and cooked in their wood oven, was the best I’ve ever had. As I kept seeing time and time again, the leftover charcoal from their wood oven was used in their soils, and apparently not by accident. After my stop in the village, I kept walking to the top of the peak to the ancient village ruins. When I finally arrived, I was granted a gift that perhaps only a soil geek would find interesting—a freshly revealed soil profile at the base of the ruins. It was not an archaeological dig; but appeared to be merely a flat pad cut from a steep hill. The top soil layer was dark with charcoal. 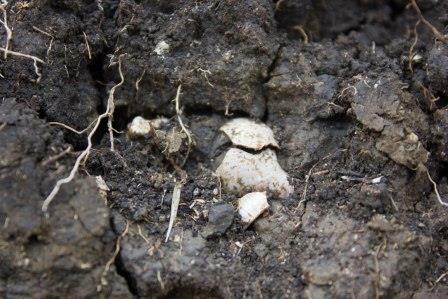 Upon further inspection I found pottery shards and shells at depth in the soil showing evidence of cultivation. These characteristics—dark with charcoal and containing pottery shards at depth—are what I have understood as key defining characteristics of the famous Terra Preta soils of the Amazon Basin. As I had walked up to the ruins, I had seen dark pockets of soil, but at first glance I found no pottery—the evidence of humans. It turns out that I just didn’t look hard enough as the pottery was mixed in with other small stones. Though I was racing the sun to get down off the mountain before dark for my return, I stopped at several of the distinctly dark soils I had seen on my way up the trail, and found the unmistakable mark of altered soils; dark with charcoal and littered with broken pottery. This fit in well with the current habitation patterns—a centralized village on the plateau above and farmhouses scattered on the hillsides. In one particular place, across from a small hut, I found both fresh charcoal and ancient pottery side by side in the “Terra Preta” topsoil. Why tell this story? One, to highlight to our biochar community that we’re among good company in our soil management practices. And two, I wanted to share the exuberant feeling of choosing to go on my own, rather than the guided tour, and the amazing discoveries that can happen on that path. On this trip, I observed fire, food, farming, and culture intertwined in an intricate balance. That is a large part of the reason I chose Peru as a destination; it was a hotspot in humankind’s evolution into agricultural practices, a cultural hub comparable to any of the greatest civilizations. Peru still retains strong connections to that past and I wanted to see if I could hear a few echoes of that. I did, though I still find it difficult to express that understanding in words. After I got home, I made a short film from the pictures I took: One Monday…Peru! The name is due to planning the trip on Friday, buying my ticket on Saturday, and flying on Monday. In this short story, I’ve highlighted the biochar-specific of aspects the adventure, but there was much, much more as is shown in the film and it is all relative—even my wetsuit for the trip had a bamboo charcoal infused lining. For more information, comments, or thoughts, please contact Josiah at josiahhunt@me.com. The courtyard garden bed in Leimebamba that started the biochar chapter of the journey; all photos courtesy of Josiah Hunt. 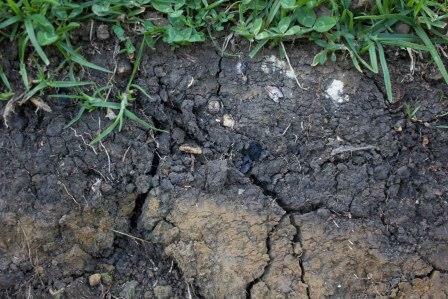 In this photo, taken on the edge of a farm in the small village of Keulap, there was a distinct line between the more natural color of the soil as was visible throughout the trail, and the darker soil on top. Within the picture there is also pottery shard and an intact piece of charcoal lying near each other.